Twelve Missouri communities have conducted GHG inventories. This is the fourth in a series of posts summarizing and analyzing those inventories. Some communities are primarily residential. They lose population during the day, as their residents go off to work and shop in other communities. Other communities have significant commercial sectors. They gain population during the day, as people from other communities come to work and shop. One can compare the daytime population gain (loss) to the residential population to give an indication of the extent to which a community serves as a bedroom community or a commercial center. 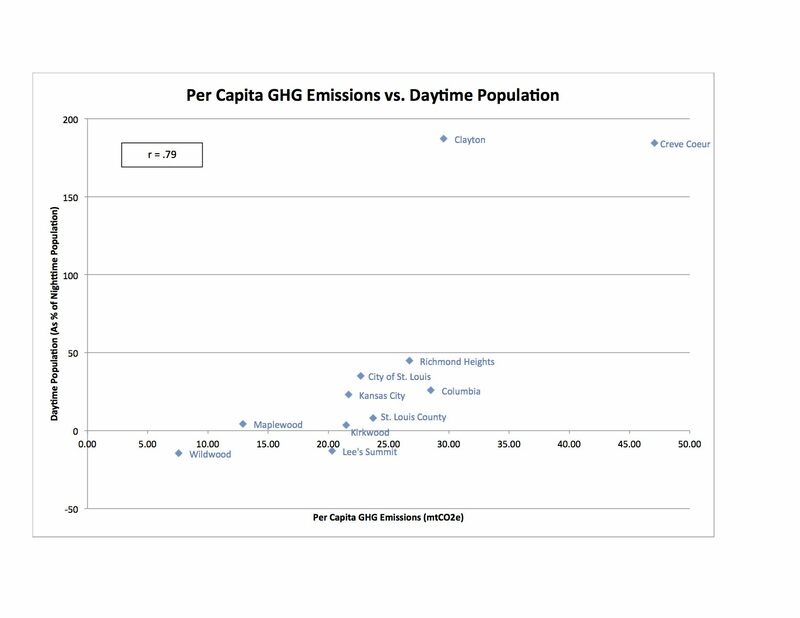 The graph at right shows per capita GHG emissions plotted against daytime population change. In this graph, if a community has a daytime population gain of, say, 187, that means that its population increases by 187% during the day. If its daytime population loss is -14.5, that means its population shrinks by 14.5% during the day. (Missouri has been omitted because it is an entire state. We don’t ordinarily think of entire states serving as bedroom communities.) One caution here: the data for GHG emissions derive from various years between 1990 and 2010, while the percentage change in daytime population are all for 2005. The correlation between per capita emissions and daytime population is +.79, a very strong relationship. (A correlation coefficient measures the relationship between two variables. It runs from -1.00 to +1.00, with -1.00 indicating a perfect inverse relationship, 0.00 indicating no relationship, and +1.00 indicating a perfect positive relationship.) Where daytime population increases, per captia GHG emissions are high. Where daytime population decreases, they are low. By mogreenstats in Climate Change, Greenhouse Gas Emissions on 2013/04/29 .